As 2016 comes to a close, we are giving away the amazing Laura Gellar ’20 Shades of Shadow’ Volume 2 makeup palette to celebrate this holiday season and the upcoming new year! One lucky winner will receive this gorgeous set full of rich, decadent shades to give you the luxe look you crave this winter. It’s a $218 value! The collection includes 20 different 0.18 oz eyeshadows in gorgeous, luxurious shades and glistening finishes. Cocoa, Stone, Java, Sunstone, Calm, Storm, Sand, Forest, Vine, Plum, Claret, Dusk, Rosemist, Royal, Iris, Pewter, Quartz, Carbon, Stellar and Almond. To enter, use our giveaway widget below. (If you don’t see it for some reason, click here). You can choose the entry types you would like to complete and skip the ones you don’t. Some entry types can even be done daily, so come back as often as you like to earn extra chances to win. It’s open to U.S. residents who are 18 and up. It starts now and ends on Monday, January 2nd at midnight MST. We will you all the best of luck and can’t wait for our winner to enjoy this gorgeous prize! I’m so excited to try this products…. The gift I am excited to give are the gifts that I hand knit. i won my daughter a playhouse! and i am so excited to see her face!!! I would love to try Laura Gellar ’20 Shades of Shadow’ Volume. I got my grand kids these race tracks from TV they have been eyeing all year. I can’t wait to see their faces. My son has wanted a pair of Nike Roshe for months & I got them for Christmas! I am excited to give my daughter her Christmas gift a chinchilla. I am so happy to be giving a smart watch to my goddaughter. Love this palette! I’ve asked for a Jo Malone perfume sampler set for Christmas – so hoping I get it! Things are really tight for us so I’m hoping to win some prizes to give my family. What am I most excited to give…hmmm…a comforter to my son to take to his college dorm…it’s star wars themed! I am excited to go back to Colorado and see my family! Excited to give my parents a photo book of their pictures from ’87-’16 for their 30th wedding anniversary! I am very excited to give my husband a beautiful cockatoo.. he is a bird fan and has always wanted this bird to add to his aviary…. OMG this palette is amazing and everyone is talking about it. thank you for this giveaway hope to win this awesome palette. I’m excited to give my boys a puppy! Giving away some makeup and cute accessories as gifts this year! i got a piphoapotamas for Christmas for my grand child and for my youngest child to play with also we are getting a new puppy but not tell next mo. them are the thins i’m excited abt seeing this year my grand child and my youngest kid getting to see them things. getting my bf a new laptop! A personalized picture I had made for my parents. A new pair of Lugz boots to my son. He’s going to love them! The gift of time ! We are going to spend time with my parents and have a great dinner !!! Wow thank you for this opportunity to win!! Good luck to all and may everyone have a very Merry Christmas! I’m excited to give some beauty gifts! Laura Gellar has such pretty makeup. I watch her when she has shows on QVC but never have tried any of her makeup. i’m excited to gift an overnight stay at the beach for my daughter and son-in-law. I gave my nephew his first bike and it was so fun to see him hop on it! I’m excited to give my sister relaxing bath products! She’s so stressed! The gift I’m excited to give this season the Lego set my niece has been wanting for years. I am the most excited to give gifts to our kids and see their eyes light up when they open them. They have reached the age where they like the gift more than the box it came in! Oh my dear Lord please let me win this one…..I’m so so excited about this giveaway. I wasn’t excited about any gifts that I gave or received this year. It has been a trying time. I was glad to see everyone. I was most excited to give my daughter a Lush Life Cosmetics set this christmas because she loves heor products so much. The gift I was most excited to give was some houston texans gear I bought for my dad…he loved it! I’m excited to give chocolate gift basket to a friend this year. I made my sister a floral monogram letter “s” with battery powered lights – it turned out awesome and I think she’ll love it. I was most excited to give my dad his favorite expensive cologne for the holidays. I gave my granddaughter an apple watch and she was os excited! I was most excited to give my husband a gift certificate to a spa. Now, I’m excited for us to go together. I was most excited about giving my daughter her record player and records. Wow thank you for this opportunity to win such a great gift! Good luck to everyone here and Happy New Year’s!! 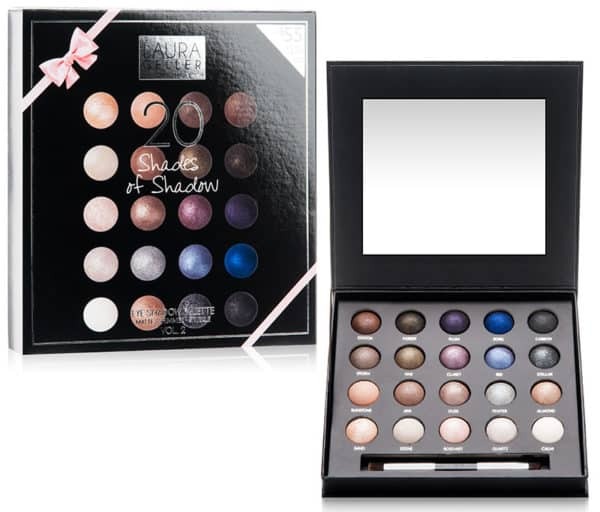 Color ME Pretty Thrifty with this gorgeous Laura Gellar 20 Shades of Makeup pallette! Would be WONDERFUL to try something new for the New Year! I was really excited to give my brother bluetooth headphones for running! It’s beautiful! I love makeup! Twenty shades of naughty colours!!!! My daughter is getting a robot dog. Thanks so much for the chances to win. Oooh! What pretty colors. My stepdaughters birthday is in a week and she would freak. THank you! I’m excited to do a lottery scratchoff exchange and see who wins the most! I was super excited to give my teen daughter a curling wand. This is good verity of colors. I gave away a couple of air fryers and they loved using them already!